This is a common bird in my backyard. My bird book calls it an "outstanding songster". However, it is because of its habits in catching and killing prey that it gets its name. It will eat insects, lizards, small rodents, and small birds. 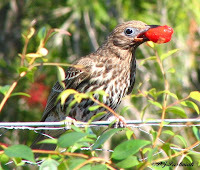 When the prey is too large to manage it will wedge it in a tree fork or on a thorn and then stand back and tear it apart with its hooked beak. Thanks Denis for a link to the call of this bird. The link is in mp3 format. Early morning and feathers all fluffed out. A few minutes later and feathers all in place. 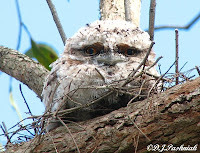 My friend with the Tawny Frogmouths in her backyard phoned late yesterday afternoon - very excited - to say that she had just found the birds again. This time they were perched a bit below head height and I would get some good photos if I hurried. Over a number of years these birds have obviously become used to this lady and have decided that her yard is a perfectly safe place so they perch wherever they like, regardless of whether it is out of reach or not. 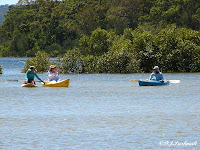 These are the photos I took - very cute I think - and worth another post! Adult bird perched a foot or so away from the others. Second adult with the 3 juveniles -my mistake in the other post - 3 not 2 juveniles. What is this person doing pointing that thing at us? (30 seconds later!) Nah - its nothing - go to sleep again! 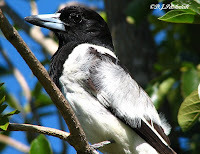 Inskip Point is certainly one of my favorite places for watching birds. 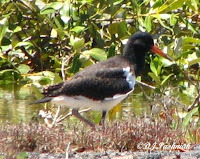 I can usually find interesting 'bush' birds in the strip of bush towards the end of the peninsular and then of course there is always an assortment of birds out on the sand flats. The most interesting bird I saw (and photographed) in the bush this time would have to be the Red-browed Firetail (Neochmia temporalis). It was late afternoon and the birds were hopping in and out of the shadow right on the side of the road. Out on the sand flats a small group of Royal Spoonbills (Platalea regia) flew in and began hunting for food in the shallow pools of water left as the tide receded. I was able to shoot a little video which shows how they move their bills in the water as they hunt for food. 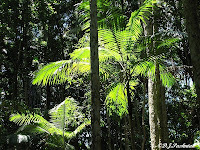 I went out today with the Gympie Field Naturalists Club on a visit to the Bymien Picnic area. 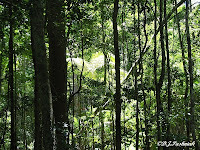 This is in a patch of rain forest just a few kilometers off the Rainbow Beach Road. Its a dirt road and although its OK for ordinary cars it is very rough indeed! From Cooloola Cove to Rainbow Beach the road goes through Wallum bushland. It is a complete surprise to drive just these few kilometers south and find rain forest and an entirely different environment. We could hear birds high up in the canopy and some came down quite close but I admire more than ever those who take such great photos of such small birds in light as difficult as this. I got quite close looks at Large-billed Scrubwrens and Brown Gerygones – which the bird book is now calling Brown Warblers. I always find it interesting to walk through rain forest like this. Where there are gaps in the trees the sun strikes through and creates great patterns of light and shade. 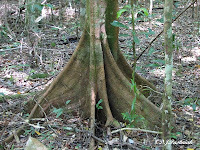 Most of the large trees have buttress roots. 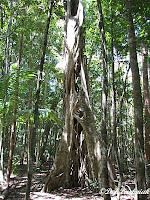 There are lots of Strangler Figs in this patch of rain forest. This tree starts as a vine which clings to a larger tree. In time the host tree is strangled and dies and a huge tree with odd hollows is left. We saw numbers of Christmas Orchid plants but only one was beginning to show a flower head. This Goanna was sunning itself along a fallen tree. Apparently these are now called Lace Monitors. 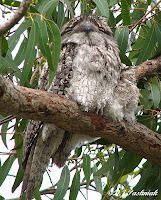 I heard yesterday afternoon from a friend that she has had a pair of Tawny Frogmouths (Podargus strigoides) nesting in her yard. She told me that the young had fledged and were about to fly so if I wanted photos I should get over there quickly. This lady retained most of the trees on her house block when she had the house built. She was urged to get rid of the trees growing there as they were not great looking specimens. 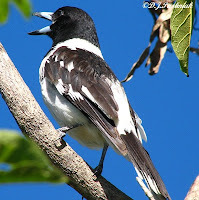 However, she knows a lot about native species and by insisting that they stay she has also kept many of the bird species which used the trees. 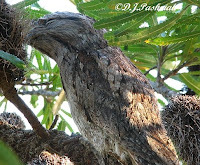 The Tawny Frogmouths nest in the same tree every year. This year they raised two young and one had teetered out on a branch and then flown to a near-by tree by last night. This morning it was still in the same tree with one of the parents while the second young one was still on the nest. I did not see the second adult. None of the birds seemed worried by my presence. 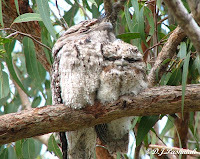 They blinked sleepily at me a few times – and the adult turned its head to one side. 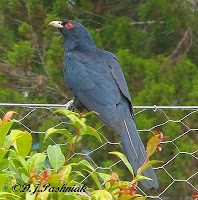 The Common Koel that I posted about last week is still around. This morning he sat in the pine tree next door. I thought it was worth another post since this time I was able to record both the coo-ee part of his call and also the frantic shrieking at the end. Fortunately he hasn't been calling right outside my window at night again. I am not arachnophobic! However, I don't go looking for spiders and I certainly don't admire them and take photos of them. But I guess there's a first time for everything and this little spider looked so pretty among the leaves and white flowers. I went on to the University of Southern Queensland guide for finding spiders and I think it might be Thomisus spectabilis - the Flower Spider. I found it in my sister's garden in Esk. The guide says its toxicity is "unknown" - but I don't think I would want to find out for myself! Any further information would be welcome. 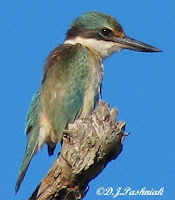 Denis over at The Nature of Robertson has a very interesting post on a Sacred Kingfisher which was unlucky enough to fly straight into his car. He makes an interesting observation that "The angle of the sun, relative to the bird and the observer, can seriously change the perceived colour of the bird." 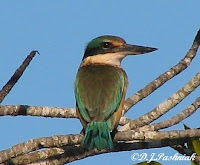 I am posting three photos of different Sacred Kingfishers which show this color difference. I have found this wide variation in color confusing to say the least. I have been advised to look for the buff spot before the eye - and then look at the other color features. I welcome further comments on this feature. I have always liked hearing the call of the Common Koel at the beginning of summer. For me it has signaled that winter is over and all the summer activities that I enjoy so much are beginning. However, I have only once had good clear sightings of both the male and female birds. They sat outside my window and I photographed them through the glass. "Monotonous shrieking crescendo of calls, most commonly a loud and shrill repeated coo-eee, rising to a frantic climax and abruptly breaking off..."
Here's a little video (although a rather shaky one!) with the bird calling this morning out on the power lines. This is not the shrieked climax of the call – just the normal monotonous part. It's enough to change anyone's mind when this goes on all night immediately outside the window. 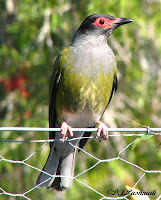 I see – and hear - Figbirds in my yard quite frequently but seldom as close as this. I had been sitting inside and heard these birds just outside the window so grabbed the camera and went outside as quickly and quietly as I could. These photos are the result. The female in the first photograph had a sour cherry in the beak from my neighbour's bush and the male sat there and watched until she had finished.